Collier’s Liquor Store- 202 Jackson Street, Cape May, NJ 08204 Tel (609) 884-8488 Fax (609) 884-0297 www.colliersliquor.com. Collier’s is the Old Grand Daddy of all Liquor Store in Cape May, it’s been legal since 1934 in Victorian Cape May. Collier’s has a in town convenient location, you can pull up and temporally park as you pick up your spirits or you can walk from Colliers to almost all Bed and Breakfast Inn’s and Hotels. Cape Liquors- Slow down after Exit 0, it’s immediatley on the right hand side, 918 Rte 109 Cape May, NJ 08204‎ (609) 884-7676- You can’t miss Cape Liquors at you near the end of the parkway at Exit 0. Cape Liquors is located on the right hand side of Route 109 before you head over the canal. We always stop into Cape Liquors to get ice and beer before heading to the Marina, it’s fast, convenient and the prices are competitive. Seagars –1613 Route 47 South Rio Grande, NJ 08242 Phone: 609 846 7695 is a Family owned and operated Tobacconist operating in the Jersey Shore area for many years. Seagars is the largest Tobacconist in Cape May County and expert dealer offering a full range of smoking accoutrements including custom lighters, ashtrays, humidors, quality cigar cutters and much more. 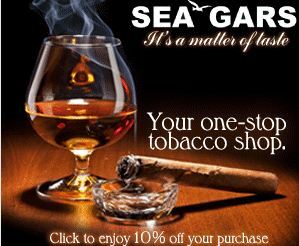 Looking for a High Quality Cigar Store in Cape May County, click above and visit SeaGars in Rio Grand NJ. Canals Liquor Store in Rio Grande – 1613 Route 47 South, Rio Grande, N.J. 08242 (Located off Garden State Parkway, exit 4a. Just two (2) blocks to store and opposite ShopRite. This entry was posted in Cape May Resort Blog and tagged Bring Your Own Bottle Cape May NJ, BYOB Cape May NJ, BYOB Liquor Store Cape May, Cape May Bring Your Own Bottles, Cape May Dinner BYOB, Cape May Restaurants BYOB, Cape May Wine BYOB, Find Cape May BYOB Restaurants, Where to Find Cape May Bring Your Own Bottle Restaurants on May 2, 2013 by Ryan Reclaim.